Black Panther could possibly break records this weekend. It was previewed on Thursday, Feb. 15 and earned $25.2 million which was the second-biggest Marvel Cinematic Universe Thursday preview ever. 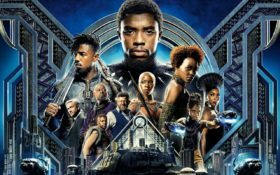 When Black Panther came out in theaters the next day it earned $75.8 million which is now considered to be the third-biggest superhero opening day in history. According to indyweek.com, Black Panther represents an encouraging trend in cinema. With a majority black cast, it portrays black people and culture from a place of power and self-reliance, not as slaves, the help, or the winners of a state championship. It shows what black writers, actors, and characters can do when given the opportunity to take center stage. To anyone planning on watching this movie, it has two post-credits scenes so don’t leave after the first one. If you still have not checked out the trailer for Black Panther click here.